You've probably tried virtual painting on a computer, but have you tried virtual painting in a virtual reality experience? 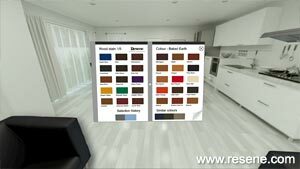 Now you can with new Resene ColourVision, a VR headset and smartphone. 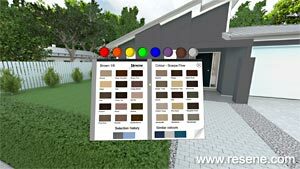 The Resene ColourVision experience lets you change the colours on a virtual reality house. Move from room to room and redecorate the walls and ceiling, and stain the floor with your favourite colours from the Resene colour range. And once you’ve finished decorating you can relax and watch the paint fly with the ‘fun with paint’ feature. It’s an easy and fun way to experiment with paint colours and see what a difference colour can make to a home. 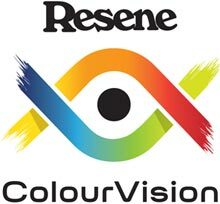 Keep an eye out for Resene ColourVision headsets in selected Resene ColorShops and at selected events. Or if you have a VR headset with an android smartphone already, you can download and use the Resene ColourVision virtual reality experience yourself wherever you are. There is also a desktop version available for use on PC. This can be downloaded via Dropbox. Resene ColourVision on Google Play also works on Google Cardboard (slightly modified version without the ‘fun with paint’ video). Resene ColourVision for iPhone is being developed for use once the new iPhone has been released later in 2017. Download the Resene ColourVision app. 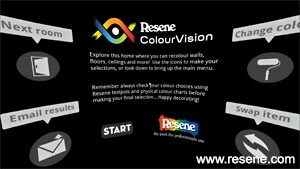 Turn on the phone and run the Resene ColourVision app. Insert the phone into the VR headset. The app takes a couple of seconds to load then observe the instructions on the splash screen and choose start. The system is based on icons. For example, if you look at the paint roller icon for three seconds, it will bring up the colour swatch interface where you can choose the paint colour. You can navigate throughout the experience by looking down to summon the navigation menu and then choose the door icon to go to any room. It is simple to dismiss the navigation menu by looking up or choose the return icon. It is possible to capture video and stills of your experience. Click and hold the back button on the right-hand side of the head mounted display. From here choose the utility menu and start either still or video capture. The files will be saved in your gallery on the phone.